A harvester unloads corn to a cargo truck at a farm in Gaocheng, Hebei province, China, September 30, 2015. 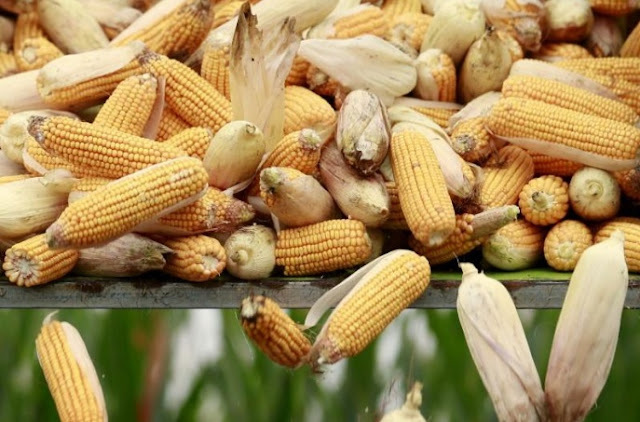 BEIJING - China imported 380,000 tonnes of corn in August, a 14-fold year-on-year jump, as buyers stocked up on cheaper imports after domestic prices of the grain rose, data from the General Administration of Customs showed on Saturday. Imports of the grain had surged in July to 910,000 tonnes, the fourth highest volume on record. Corn is mainly used to feed livestock and China is the world’s top pork producer. Sugar imports, meanwhile, fell 45.4 percent year on year to 200,000 tonnes, as hefty anti-dumping tariffs introduced in May curbed demand at the same time as many buyers ran out of import quota. Imports had already dropped to the lowest level in three years in July, plunging to just 60,000 tonnes. China slashed permits for out-of-quota sugar imports to around 1 million tonnes, almost half of last year’s allowance, to curb imports it says have damaged the domestic industry. With most buyers out of quota, imports are expected to dwindle for the rest of the year. China imported 380,000 tonnes of corn in August, a 14-fold year-on-year jump, as buyers stocked up on cheaper imports after domestic prices of the grain rose, data from the General Administration of Customs showed on Saturday.